PLANT SALE: will be at the forecourt of the Horns Lodge this Saturday (May 20) from 10am to midday. As the sale is being organised by the Horticultural Society there will be excellent summer bedding, tomato plants, vegetable plants, perennials and much more. For more information call Peter Estcourt on 01273 400791. EARLY SUMMER STROLL: on Lane End Common takes place this Saturday (May 20) and all are welcome. Meet members of the Commons Society, at Lane End Common car park, ready to start the stroll at 2.30pm. This is a chance to experience the heathland and look at the butterflies, flowers and trees there. CRICKET: sees Chailey in a friendly against Hove Unicorns, this Sunday (May 21) starting at 2pm, at the sports ground just off the A272. If you would like to play cricket on Sundays, regularly or occasionally, you will be made most welcome. If you wish to play or would like more information call Peter on 07709946880. ​VOLUNTEERS NEEDED PLEASE: Chailey Heritage Foundation have stands to promote their Patchwork Farm and all the other things that Chailey Heritage does on Saturday May 27 at the Heathfield Show and Thursday, Friday and Saturday June 8, 9 and10 at the South of England Show. They would welcome some help on the stands and if you were able to give just a couple of hours they would be most grateful. If you are able to assist please let Joan Martin, Fundraising Officer, know on 01825 724444 ext. 718 or by email fundraising@chf.org.uk. OPPORTUNITY TO JOIN CHAILEY PARISH COUNCIL: A vacancy has arisen on the Parish Council which the Council proposes to fill by co-option. Any eligible person who wishes to be considered as a candidate to fill the vacancy should submit to the Council a brief curriculum vitae and a written statement explaining why he/she wishes to join the Council and the skills and experience that he/she would contribute to the work of the Council. This information must be sent to the Clerk to the Council at the Parish Office by Friday May 26. If you have any questions regarding the role do contact Clerk, Stephen Treharne, at The Reading Room, Chailey Green, or via email at chaileypc@btconnect.com or on 01825 722388. APPRENTICESHIP OPPORTUNITY: The Bluebell Railway has an exciting vacancy in the Locomotive Department for a young person looking to turn his or her engineering skills toward steam preservation. The Locomotive Works Apprentice will undertake a course of study in mechanical engineering and will carry out supervised work and training in the Locomotive Works on the repair and maintenance of steam locomotives. A level of competence in the operation of hand and machine tools and electric and gas welding is preferred. Educational standard must be A-C in Maths, English, and Science. This is a three-year project funded by the Heritage Lottery Fund. The Locomotive Works operates seven days a week, and some weekend work may be required. Contact Lisa Boyle on 01825 724884 or via lisa.boyle@bluebell-railway.co.uk for further information. The closing date for applications is Thursday June 1. WOMEN’S INSTITUTE: meet on Tuesday June 6, at the village hall, at 7.45pm when the speaker will be Jackie Marsh Hobbs on the subject ‘The Secrets of the Royal Pavilion’. The group are always pleased to welcome prospective members and guests for a nominal donation of £3, to include homemade refreshments. To find out more call Margaret Smith on 01825 723519. BLUEBELL RAILWAY VOLUNTEERS: Have you ever wondered how to become a volunteer, what it entails and who to contact? Whether you are male or female, skilled or with no previous experience, can offer a day a month or more, then why not go along and find out what volunteering in the various different departments on the Bluebell entails. If you are under 16, you can gain experience of such work in the 9F Club, but for those who are over 16, perhaps newly retired, or any other age, why not find out more? To help you narrow your choice of departments please ask for a volunteer recruitment pack on 01825 720800. To help you choose, you can also join one of the ‘find out more tours’; the next tour is on Sunday June 11. The meeting time is 10.30am, at Sheffield Park Station, and the day should end around 4.30pm. Book your place on the tour by contacting the General Office on 01825 720800, or just turn up at Sheffield Park on the day. NIGHTJARS ON RED HOUSE COMMON: Do join members of the Commons Society and hear the sound of male birds churring on the Common on Tuesday June 13. Meet at 9.15pm at the Sports Clubs car park (at the Memorial Common off the A272 west of Chailey crossroads). The evening will finish in the dark so take a torch. 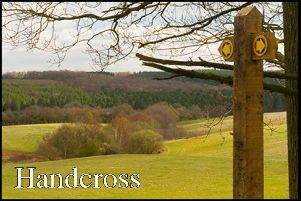 ANNUAL DAY TRIP: organised by the Commons Society is on Saturday June 17 and is a visit to Norbury Park near Leatherhead. This is a large country park and wildlife area on the North Downs. There will be a countryside walk so suitable clothes and shoes will be needed, plus a picnic lunch. There are toilets and a Tea Shop at the coach park. Depart Sports Club car park at 9.30am and return about 5pm. The cost will be about £15, to book a place call 01444 831098. LUNCH CLUB: at St Peter’s Church is held monthly at 12.30pm in the church on Chailey Green and the next lunch club is on Thursday June 22. All are welcome to go along for a delicious meal, meet new people and chat and relax. The food is freshly prepared and home-cooked with a main course, choice of puddings and tea/coffee all for £5 per person. There is easy access and disabled toilet facilities. If you require transport or further information please contact Julia Guerard on 01825 722967.